The Italian Post-Apocalypse film industry of the early to mid 1980s was not much more than an attempt at cashing in on the success (both critical and commercial) of George Millers Australian epic Mad Max 2 (aka The Road Warrior). Although many of these films had a certain appeal, they could not match George Millers original for design, action and the depiction of a lawless wasteland where life was cheap and expendable and some resource (for example, fuel) was the main commodity. The villains in Mad Max 2, Pappagello and Wez, were truly scary and formidable characters – something all the Italian Post Apocalyptic films lacked. Likewise, none of the Italian films had a Max Rockatansky (Mel Gibson), who was a brooding, powerful presence – a broken man who despite all he had lost managed to maintain his humanity in the most dire and dangerous circumstances. Laser guns, explosions and Fred Williamson in a metal headband with an archery bow. With motorbikes flying through the air. Plus the obligatory customised car. It looks great, the artwork is good and it sells the film (which is one of the better of the genre). Treat it like a visual checklist of some of more obvious elements of these movies, but cherish it for being a damn good marketing tool. I had a huge poster of this in my bedroom in 1983, gained from the video rental shop (Replay) in Fazeley. Because the man who worked there fancied my mom. 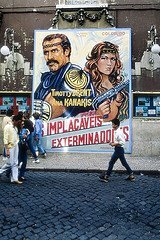 Finally, the fine Portuguese entry for ‘The New Barbarians’ (aka ‘Os Implacaveis Exterminadores’) – a bespoke cinema poster from 1982. An amazing find!